So, I had a shot at doing an atmosphere simulation with sun and clouds. 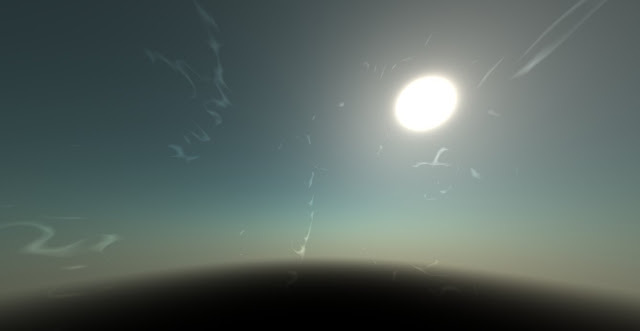 I hooked it into date and sun position libraries and have a realistic day-night cycle going thanks to that. The aim is for it it all to be procedurally generated and realtime. On my computer (with a Radeon 5750) it runs at a steady 60fps at 1920x1080 resolution. The atmosphere is an attempt to be fairly realistic and account for atmospheric scattering. This walkthrough by Florian Boesch made the maths really clear. I am going for a wispy oriental look for the clouds, like how I would imagine clouds in a game like Okami would look, but with a 3D appearance. It turns out that it's relatively easy to create the effect using turbulent noise, rather than generating realistic clouds. I am currently up to adding some extra bits like JSON models and a minimap. Also, collision detection using Physijs. Eventually I will add proper lighting for objects in the world and add some nicer models, and then release the code. May try to get it added as a Three.js example, if it turns out well.